(1) Preparing Nutritionally-and-Health-Balanced Meal and (2) Supervise/Administer Galley Area. Module 1: Tackles Preparing Nutritionally-and-Health-Balanced Meal. Which is mainly concerned with the overall components of a healthy and balanced meal. In this module, you will be taught how to request ingredients and other supplies, identify the main components of a balanced meal, profile the crew, plan the menu, and plan the cycle menu. Lesson 1: Identifying the components of a health-balanced meal. Lesson 3: Planning the Menu. Lesson 4: Planning the calendar cycle or cycle menu. Lesson 5: Requesting ingredients and supplies. At the end of this module, you can be able to classify the top six key nutrients, recognize the right food intake daily and determine the principles of food plate. Module 2: Supervise Administer Gallery Area. On the other hand, will educate you on how to supervise/administer Galley is. This module basically teaches you about maintaining galley supplies, equipment, facilities and how you could address the concerns of the administration regarding the galley. Lesson 2: Maintain Gallery Equipment and Facilities. Lesson 3: Deal with Administrative Concerns in the Gallery. At the end of this module, you will be able to identify the various equipment and galley areas, know how to properly select cleaning materials and use these cleaning materials based on their specifications. Note: Tesda Online Program does not issue any training certificate of completion. If you are aiming to have a National Certificate (NC) in Ships Catering, you may go to the nearest Assesment Center and take the national Assessment. 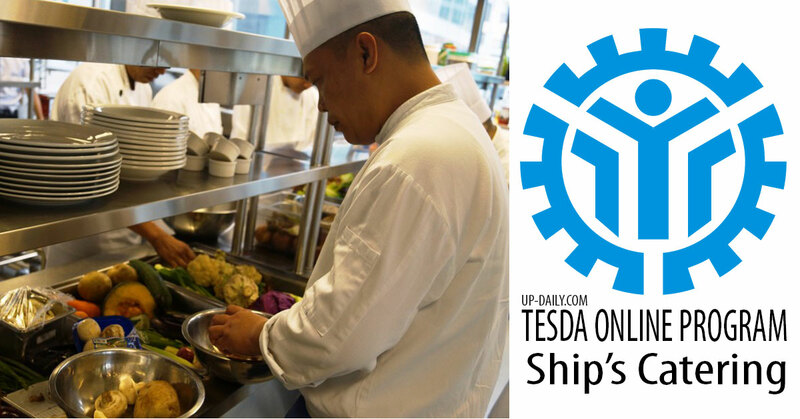 Ships’ Catering learners are required to take Ships’ Catering NC II.